iPad Mini starts at $329, is thinner than a pencil and weighs 0.68 pounds, which is as light as a standard pad of paper. These measurements make the iPad Mini 23 percent thinner and 53 percent lighter than the third-generation iPad. The tablet is a 7.9-inch device with a 1024 × 768 pixel resolution. “Easy to remember. 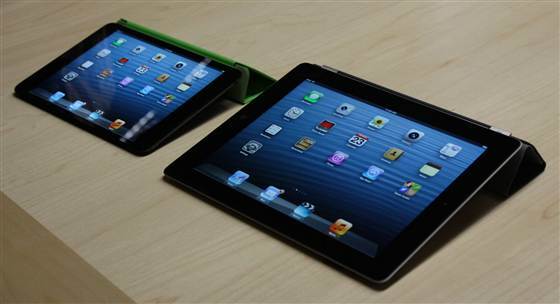 7.9, 9.7,” Schiller said, contrasting the measurements of the iPad Mini and the regular iPad. Like the iPad, the iPad Mini has a line of accessories such as Apple’s Smart Covers, naturally. “It is every inch an iPad,” a commercial shown during the event emphasized. The iPad Mini starts at $329 for a 16GB Wi-Fi-only model. 32Gb and 64 GB Wi-Fi-only models are available for $429 and $529, respectively, while their LTE-capable counterparts are priced at $459, $559, and $659, for the 16GB, 32GB, and 63GB versions, respectively.